When I first looked, I found the illustration confusing. Was the younger man hypnotizing the bearded guy? Or flashing some kind of mysterious ray? Then I figured it out. Last night we were watching the Giants game and the lights flicker and I lost my internet connection. At the ballpark, the lights and the scoreboard went out. Some of the lights on the bridge did, too. The Giants have demoted Barry Zito to the bullpen. He's been having troubles. The Feel of the Rope tells the story of San Francisco's cable cars. That story has been told in more books and videos than anyone can count, but Nick Tomizawa's The Feel of the Rope takes a unique perspective. Like many other videos, it shows the cars climbing the hills, talks about the technology, and illustrates the history with well-chosen old photos. 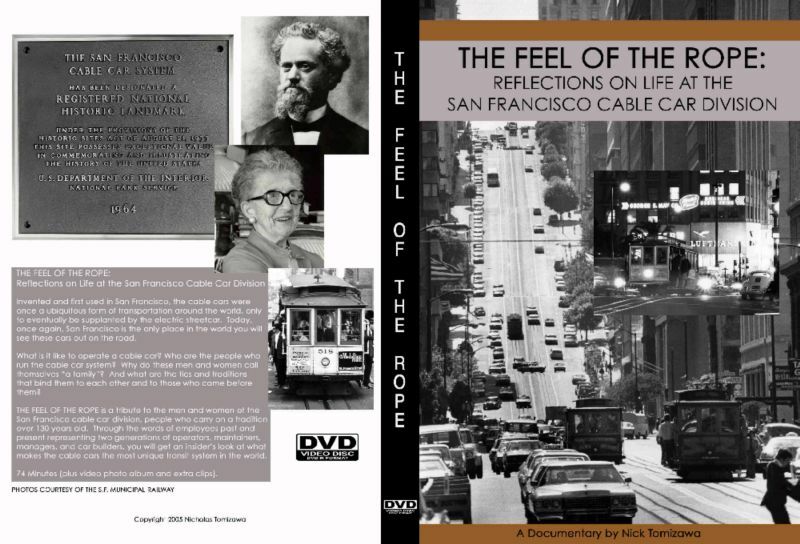 But this dvd is special because it concentrates on the men and women of the Cable Car Division. These dedicated people talk about what they do to keep the system working and how they interact with the public and with each other in their daily work. The video makes it clear that this is an unusually devoted family of people who give their best efforts to make the cable cars safe and available for the many people who want to ride them. The quality of the video images and the sound is excellent. I enjoyed the use of classical music in the score, especially in an opening montage showing closeups of the various interview subjects. These were faces with a lot of character. My whole family enjoyed it. 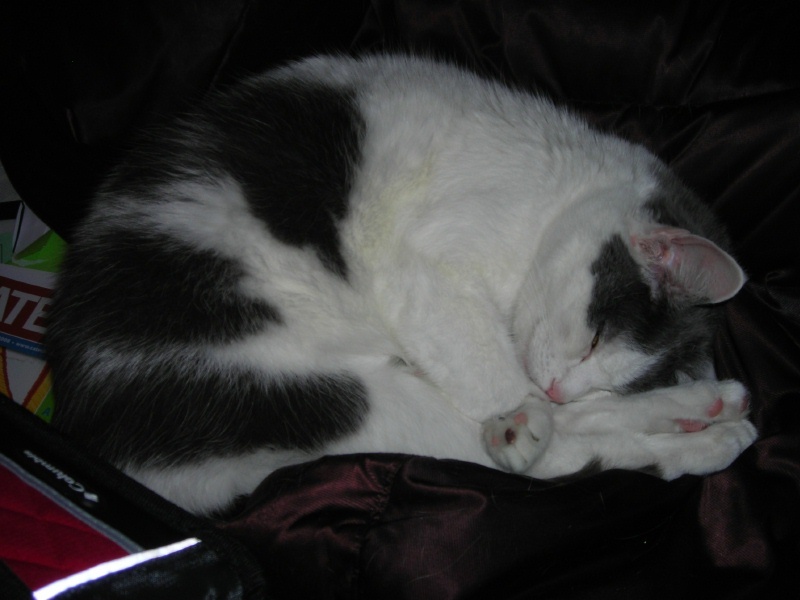 I took this photo on 05-April-2008. I walked by the ballpark at lunchtime. I was wearing my 1987 National League Western Divisions Champions shirt and my cap. Three people asked me if there was a game. It was warm. Yesterday Lincecum beat the Padres 1-0. Today Sanchez is doing well against the Reds. It is nice to see Dusty Baker back in the park. I haven't seen much about the 100th anniversary of the New York to Paris round-the-world race. 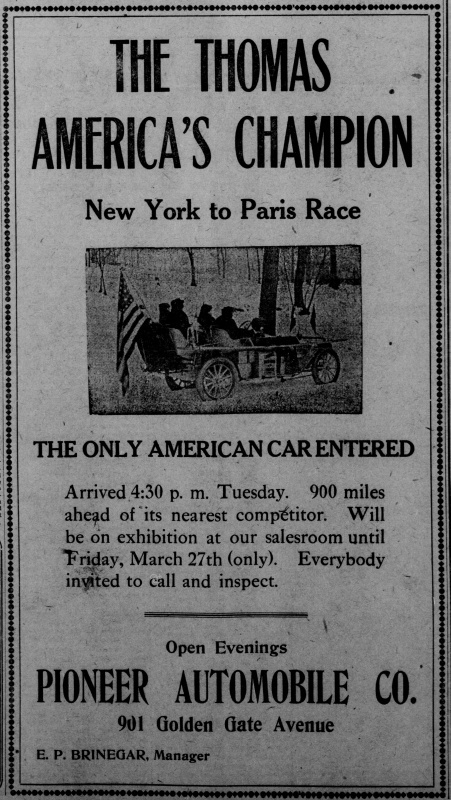 This ad from the 25-March-1908 San Francisco Call advertises that the only American entry, the Thomas Flyer, had arrived in San Francisco the previous afternoon, far ahead of its competitors. 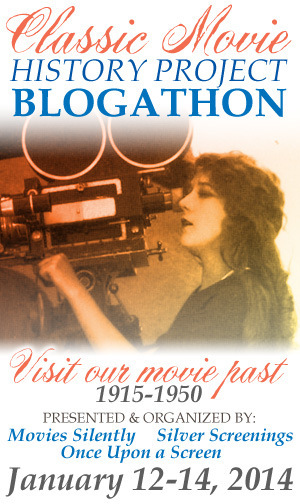 Edgar Preston Brinegar was a leader of the Lincoln Highway Association. No comment. 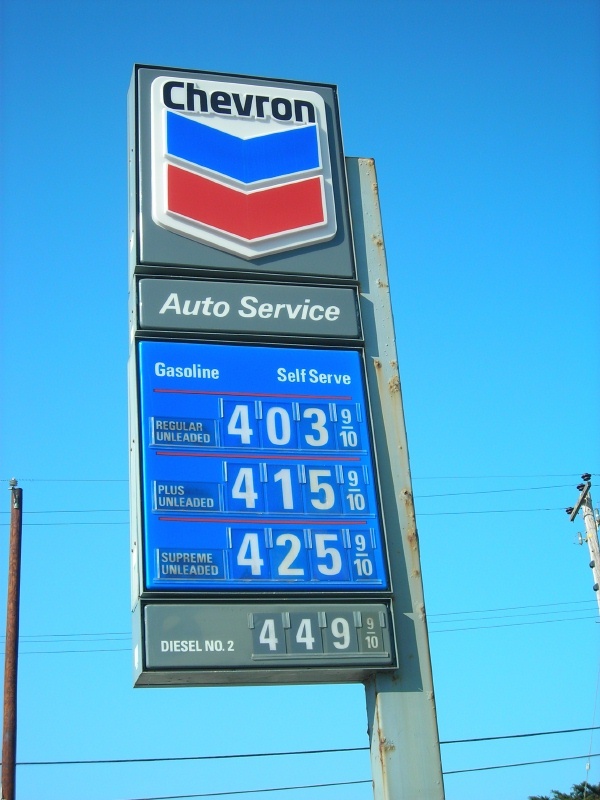 I took this photo at the Chevron Station in Pacific Manor. It was interesting to watch the Pope's visit. It was very windy again yesterday. Devil's Slide was closed in the morning, I expect because some signs got blown over. Joe Calzaghe beat Bernard Hopkins on a split decision to take the light heavyweight title. Calzaghe started slowly, but he kept pushing and landed a lot of blows, including at least three low ones, one judged to be intentional. It was a rough fight all around. Hopkins is getting old. He knows enough to deliver his low blows with the hand away from the referee. The Giants won in Saint Louis. They have won all four games that Lincecum has started, and he is 3-0. It was very windy and cold today. The car kept trying to change lanes on 280. We were eucharistic ministers at mass. I woke up at 3:30 this morning. I thought: If I get up now I can make it to Lotta's Fountain in plenty of time to make the ceremony. I thought this might be the last year we have a survivor at the ceremony. I went back to sleep. I feel ashamed. The radio went off at 5:29. They were talking about an earthquake in the midwest. It was only 5-point-something. It was not on the New Madrid Fault, but on a tributary. There were no injuries and not too much damage. I was stuck inside all day at work, so I didn't even get to go see the wreath. iPod stuff: The current Baseball History Podcast (http://bhp.libsyn.com/) -- the definition of "Major League.". The current BBC History Magazine podcast (http://www.bbchistorymagazine.com/) -- a book about Anglo-Dutch relations and a historian who talked about John Churchill's campaigns. They are making progress on the new home of the Jewish Museum, in the Jesse Street substation. Heavy fog last night and today over the ocean and right over the coast. Bright and sunny inland. iPod stuff: Podcasts on the Disneyland Railroad (http://www.disneyland.com/), the 2006 cable car bell ringing contest (http://www.sfgate.com/), and two about baseball history (http://baseballhistorypodcast.blogspot.com/) -- Christy Mathewson and Ernie Lombardi. I'm itching to do one of my own. 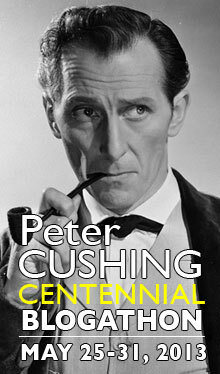 When I was in college, I discovered William Baring-Gould's The Annotated Sherlock Holmes. I read the whole thing one summer. It was from this work that I discovered that there are people who do not believe that Sherlock Holmes and Doctor Watson really lived, and who believe that one Arthur Conan Doyle not only wrote the stories but made up the characters. 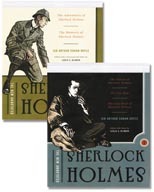 In The New Annotated Sherlock Holmes, Leslie S Klinger considers the scholarship that has taken place since Baring-Gould's monumental work in the 1960s, and also takes into account that we are farther in time from the world of Holmes and Watson and that even more things need to be explained, especially to us Americans. I recently read volumes one and two, which present all the short stories, in the sequence in which they were published in books. This puts them slightly out of the order in which they were written and the order in which they were first published in magazines, but I like it better than Baring-Gould's effort to present the stories in the order in which he felt they actually took place. I enjoyed Klinger's footnotes and explanatory essays. I had never realized how many wicked colonels there are in the canon. And how many women named Violet. He takes a moderate view on the number of times Doctor Watson may have married. Now I have to start saving for volume 3, which has the novels. 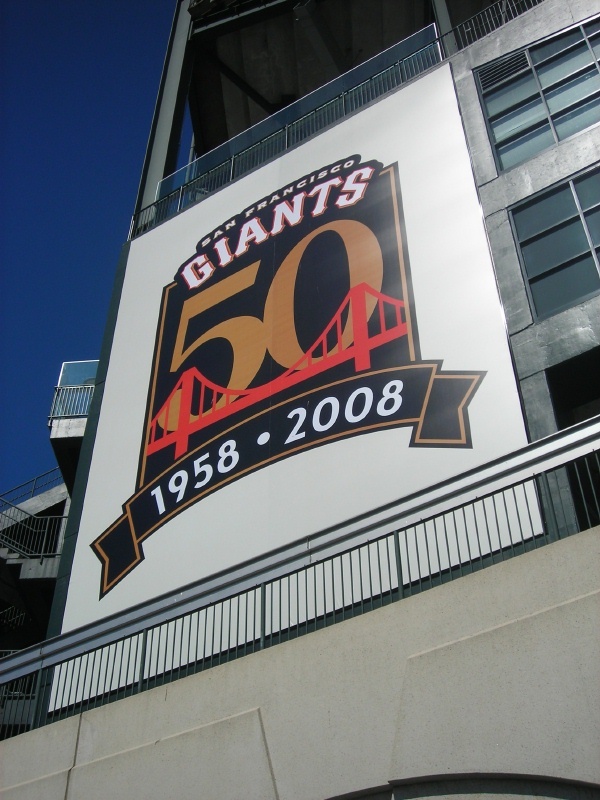 The Giants won their first game in San Francisco on 15-April-2008. Today they lost to Arizona. Last night they beat Randy Johnson. The Giants called up John Bowker from Fresno after the Grizzlies played on Friday. He drove up Saturday morning and arrived just before batting practice. Saturday he hit a home run. Then the bullpen blew the lead and we lost. Today he hit a home run. The bullpen nearly blew the lead, but we won. It had been warm for some days. I started wearing a lighter jacket to work on Thursday. Today we were at my mom's house for dinner. I was sitting with her in the kitchen and I heard the fog horns. The fog came in quickly. I took the photo on 24-March-2008. Last week I inherited an iPod Shuffle. On the bus, I listened to music from Boogie Woogie Flu (http://boogiewoogieflu.blogspot.com/). 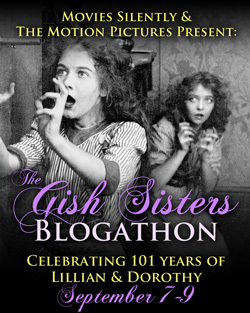 This week I listened to a podcast about the upcoming Slapsticon from Stolen Moments (http://rudyfan.libsyn.com/). I wish I could go. 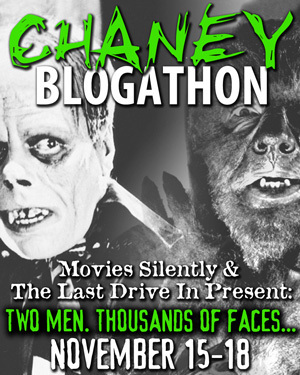 Then I listened to some old radio shows from The Third Banana (http://thirdbanana.blogspot.com/). I'd like to try a podcast. When I got a cassette recorder in the Seventh Grade, I made my own radio shows. Company 35 at Pier 22 1/2, Embarcadero and Harrison, is the home of the San Francisco Fire Department's two fireboats, Phoenix and Guardian. The station was built in 1915. Phoenix helped to save the Marina District from a huge fire after the 17-October-1989 earthquake. 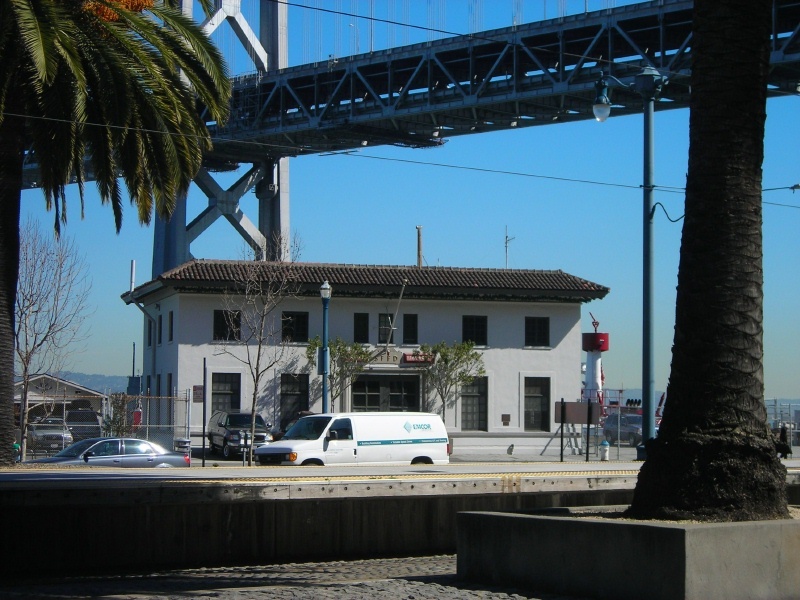 Two people who lived in the District donated money so San Francisco could acquire Guardian, a former Vancouver fireboat. In other news, the Giants won their second game yesterday. A lot of people worked from home today because the Olympic torch run was expected to draw big protests. Lots of people for and against China's policies gathered by Pac Bell Park and along the Embarcadero and had some scuffles. I was out about 12:20 and saw 15-20 motorcycle cops head north on Third. The mayor deked both sides by having the first runner duck into Pier 48. Eventually a convoy rolled out and wound up at Van Ness and Pine. The runners ran from there and out to the Marina. He cancelled the ceremony at the Ferry Building. 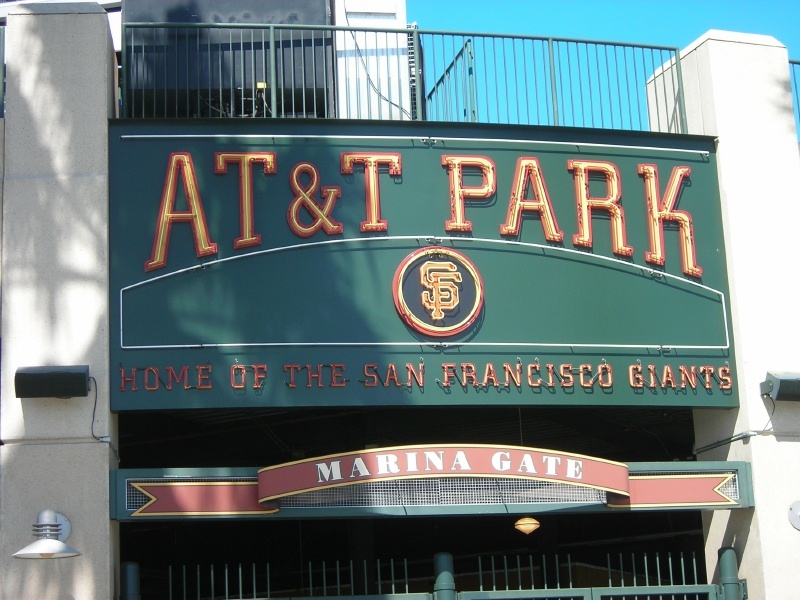 Today the Giants played their home opener against the Padres. The Padres won 8-4. Before the game, the surviving 1958 Giants rode around the field in convertibles. I would like to have seen that. This morning when I was walking to work, there was a huge line of buses for the RSA Conference at Moscone Center. Despite the game and the conference, traffic was reasonable on the way home. Here is the third part. He continues his discussion of an attempt to build a battery and electric motor that could power a lathe. Macedonio Melloni was an Italian physicist who studied the properties of heat. Antonio Pacinotti was an Italian physicist who improved the dynamo. Zénobe Gramme was a Belgian electrical engineer who created the first dynamo useful in industry. Dr Van Der Weyde's comment that he considered the dynamo, "as the most lofty product of the combined ingenuity of the civilized human race," made me think of Henry Adams' comments in The Education of Henry Adams in the chapter "The Dynamo and the Virgin": "...but to Adams the dynamo became a symbol of infinity. As he grew accustomed to the great gallery of machines, he began to feel the forty-foot dynamos as a moral force, much as the early Christians felt the Cross." I like the Doctor's comments about how much the world had changed for the better during his life and how much he expected it to change after. Career as an Electrician (continued from p. 59). -- Everything went on favorably for awhile (at least as far as superficial examination appeared to show), and the electric motor had become the admiration of all friends who saw it, especially after the man had been instructed how to shunt out, by means of a piece of wire, any cell which appeared doubtful, and when, by a galvanometric test, it proved defective, to substitute a freshly charged cell, without interrupting the current, and consequent motive power. I had long before made an astatic galvanometer, of which the magnetized needles were made of pieces of watch spring, while the coil was made of fine wire covered with silk, which at that time was not in the ordinary trade, but had to be made to order in one of the European capitals, as well as the copper wire. 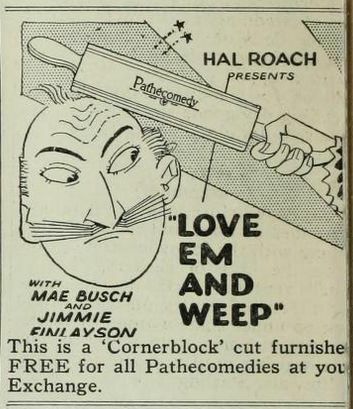 As the city of my residence had no industries of this character, it often taxed my ingenuity to procure what I wanted. Thus, for instance, I had saved for a long time the very fine wire covered with silk which I obtained from my mother, whose lace collars and caps were, according to the fashion of that time, stiffened with such wire, which at every washing had to be taken off and renovated. * Such stiffenings for lace were at that time sold in fancy stores of all widths desired; they were imported from England, and very well made. I bought some of the new material, disentangled its complexity so as to obtain the straight separate wires, and made several galvanometers, which rendered me great service for more than sixty years, and do so still. One of them was so sensitive that if I coiled up one end of the conducting wire into a little ball, heated this in an alcohol lamp, and touched it with the other end of the wire, which was cold, a deviation of the needle showed the existence of a current. This interesting little experiment was not original, but found by me in one of the Italian scientific periodicals. It was due to Melloni, who has made himself famous by his thermo-electric pile, which is the most delicate, and, in fact, the only instrument for the detection of slight differences of temperature in small bodies. The apparent success of my motor was, however, a delusion and a snare. This became apparent when at last the great point, which lies at the bottom of all enterprises, was considered -- namely, the question: Does it pay? Wages were low in Europe, especially at that time, and always much lower than here, while the materials consumed in the battery -- zinc and acids cost much more there than they do here now, thanks to the great improvements of manufacturing processes which have taken place. The result was that the most simple calculation of the cost of the battery showed that its maintenance was considerably more than the wages of the man, and then, very naturally, the idea was conceived to furnish the fly-wheel with a handle, and let the man turn the crank. This was found to be a very much more profitable arrangement, saving as it did the great cost of oxidizing the zinc and renovating the zinc plates, and the still more considerable cost of acids, salts and other substances which had also been tried, in order to find which of them was the best suited for the intended purpose. 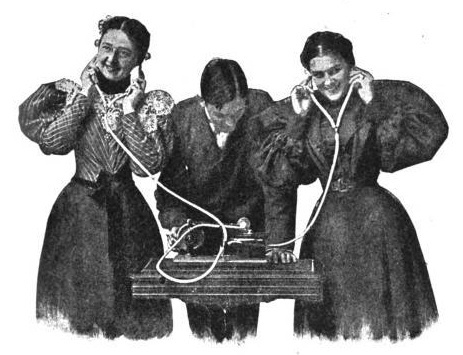 Then I came openly forward and published an account of my experience, for the benefit of my co-laborers in the same field, of which the sub stance was this: "To my co-laborers on the great electric problem of the day: As long as we have no cheaper source of electricity than what we can obtain from voltaic batteries, it is of no use to make electric motors, because their cost of maintenance surpasses that of steam some fiftyfold, and even considerably more. Zinc, a product of art, costs much more than coal, while coal, a product of nature, costs only the labor of mining and transportation. Next comes the oxidation of the zinc, which is the source and origin of the electric current, and can only be obtained by expensive acids, or solutions of salts, or their equivalents, which, in fact, cost again as much as the zinc, or even more, while coal for its oxidation consumes only the natural atmospheric oxygen, which costs nothing." The ultimate outcome of the experience obtained was published in detail in a scientific weekly published in Haarlem, Holland (entitled Algemeene Konst en Letterbode), March 15, 1844, in which I proved that in steam we have a cheap and powerful agent, while electricity is expensive and weak. I closed my communication with the following prophetic remark: "But how to obtain cheap and powerful electric currents is a question about which nothing is known at present. For its solution, the application of an entirely new, and, as yet, unknown principle will be required." It took thirty more years of study and experimentation to find this entirely new principle. Pacinotti, in Italy, started, in 1878**, the discovery of the new principle which I suggested, by inventing a motor with a continuously-wound coil, in which the current was intended to flow, and did flow, steadily in the same direction without interruption, or commutators for reversing the direction, which before that time was the only method known; and he stated in his description that if his motor was rotated by mechanical power with sufficient velocity, it would produce an electric current. 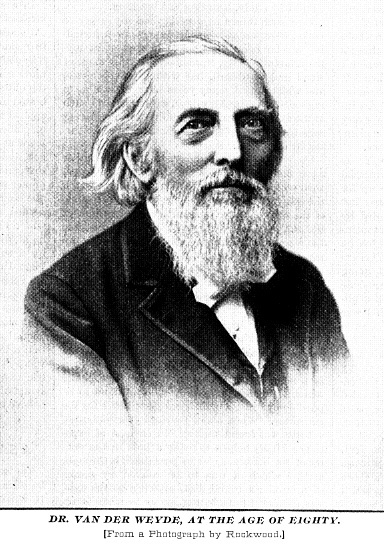 He did not try this, but Gramme, in France, did, and the Gramme dynamo was born, which was the impulse to the construction of nearly infinite varieties of dynamos, which are still daily increasing, and cause those who are initiated in the details of their construction to watch with much interest every new step forward, and say to himself, What next? I consider the dynamo as the most lofty product of the combined ingenuity of the civilized human race. 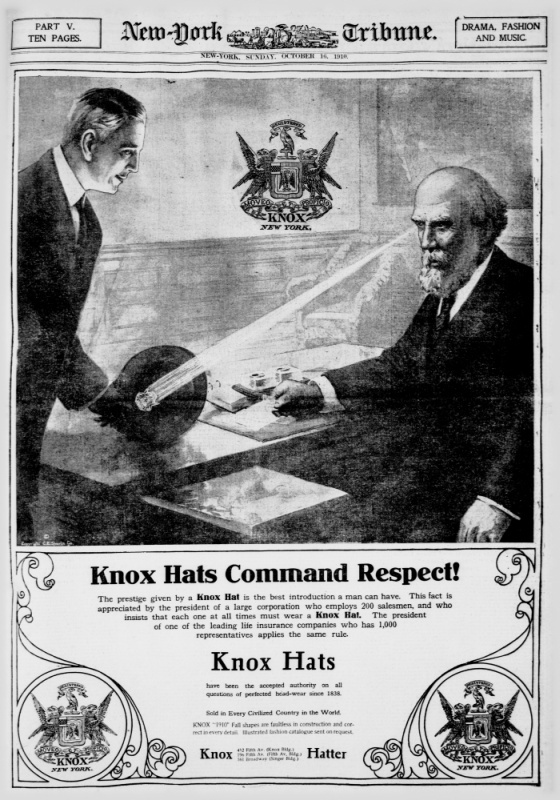 The principles on which it is based developed themselves slowly from the experimental labors of the great men (too numerous to name here) who spent their lives in the investigations of the properties and laws of the great natural power of which the knowledge and application belong entirely to the nineteenth century. We leave, indeed, a glorious legacy to the generations of the twentieth century; let them proceed on the paths which the present generation has pointed out, and the results will be such as no one has the capacity to conceive. Grateful as I am not to have been born a century earlier, when, without steam power, without steam navigation, without railroads, without gas, without electric telegraphy, heating, illumination, and electric transportation, the world was scarcely worth living in, still I envy the children of to-day who will be able to see the results of what those colossal dynamos will accomplish, which we now see constructed; and I regret deeply that at a period when the world has reached a point when the most startling and the most beneficial discoveries will be ripe for application, it will be time for myself and my contemporaries to leave the scene; but we trust that our posterity will progress in the same path that we have opened to lead humanity to the realization of the comprehensive word -- "Excelsior." * The large collars seen in Queen Elizabeth’s portraits were stiffened in this way, and such collars were in her time much used even by gentlemen when in full dress. ** See the journal Nuovo Cimento. Aviator Farnum T Fish in his Wright biplane. "Fish carried a passenger during the entire time he was in the air in the afternoon, saying: 'When I go up I like to have somebody to talk to.' Fish carries passengers as a matter of course and not as a special stunt. He is as matter of fact about it as if driving an automobile." http://www.earlyaviators.com/ reports that he went on to fly in Mexico during the Revolution and lived until 1978. 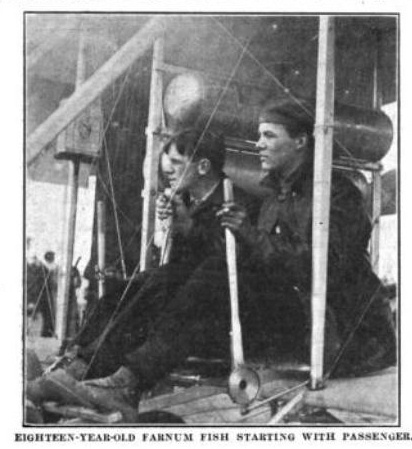 This photo is from Aero and Hydro: America's Aviation Weekly, 03-February-1912. A friend who works at Apple informs me that the next big thing in iPods will be the one terrabyte, multiuser version. Watch for it.